Special US stamps were issued in 1911, to pay the fee on registered mail, and in 1955, to pay the fee on certified mail. These two short-lived issues offer a great opportunity for the stamp collector, as they are both still relatively common. Both of these categories can be COMPLETED in mint condition, for under $50, or in used condition, for under $10. 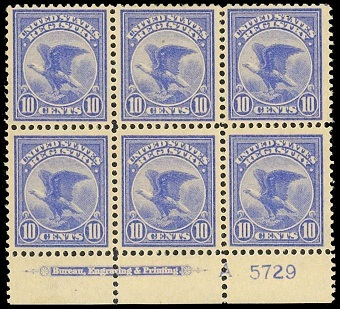 Even a plate block of the 1911 registration stamp, similar to the one shown above, could be located for well under $1,000, if one shops around a bit. This is not the case with the completion of most of the other categories of United States postage stamps, as that effort would require a minimal outlay of many thousands of dollars. The registered letter system for United States mail took effect on July 1, 1855. Between then and the end of the 19th Century the registration fee fluctuated at between five cents and twenty cents. The registration fees were usually paid in cash, with appropriate postal markings, or by the application of additional postage stamps to the registered letter. Early registered letters, with multiple stamps and postal markings are highly prized by US philatelists. The 10 C. denomination registration stamp (Sc. #F1) shown above was issued on December 1, 1911 for the prepayment of registry fees. These new US stamps were ONLY VALID for the payment of the registry fee, and they WERE NOT valid for regular letter postage. The classical design of these stamps features a majestic looking American Bald Eagle. They were engraved, perforated 12, and printed on paper with the single-lined USPS watermark. An example of the registration stamp, used on a 1912 registered letter envelope, is shown above. The use of this stamp was abolished on May 28, 1913, though their use was permitted until the supplies-on-hand were exhausted. Since 1913, additional regular definitive postage stamps have been used to indicate the prepayment of the registration fee. Certified mail service was implemented on June 6, 1955. This service provides proof of mailing and proof of delivery for first class letter mail, at a lower cost than that of registered mail. The certified mail charge is in addition to the regular letter postage, whether it be for surface mail, airmail, or special delivery. The 15 C. denomination certified mail stamp (Sc. #FA1) shown above was issued on June 6, 1955. The modern design of these stamps features a letter carrier. They were engraved, perforated 10 1/2 x 11, and printed on unwatermarked paper. No other certified mail stamps were issued after 1955. Since then, additional regular definitive postage stamps have been used to indicate the prepayment of the certified mail fee.